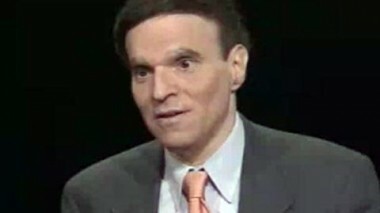 I’m Richard Heffner, your host on THE OPEN MIND. By profession, I’m a teacher. Yet even to me the commanding professions of our times are those of medicine and the law. And if from time to time you’ve watched The Open Mind over the past quarter of a century, you know that the practitioners of both of these noble followings most frequently are my guests on this program. But it seems to me that there is a difference. Doctors seem more concerned about their patients; lawyers about their professions, procedures and prerogatives. More and more doctors talk about preventive medicine. Comparatively little, if anything at all, is said, however, about preventive law. I’ve wondered as a layperson, wondered seriously, if it’s because conceptually that’s an impossibility, or because perhaps American lawyers simply take their relationship to justice less seriously than doctors do take their relationship to their patients’ health. And so I’ve invited as today’s guest on the Open Mind, a legal scholar and gentleman who has thought long and hard about justice and the law, whether they are one and indivisible, or two and sometimes quite separate adversaries themselves. Robert McKay is director of the Program on Justice, Society, and the Individual of the Aspen Institute for Humanistic Studies. For some years he was Dean of the New York University Law School. And among his many other public services, we must list his chairmanship of the New York State Special commission on Attica. Dean McKay, thank you for joining me today. I didn’t know whether, when I scribbled those words, whether you would consider it unfair or perhaps irrelevant to note that my own impression is that lawyers don’t quite seem to relate to justice as an end, as doctors do to their patients’ health… is that unfair, totally? McKay: I think to some extent that’s true. Lawyers like to think that they are concerned with the doing of justice, but their first concern is to their client. You spoke about the concern of doctors for their patients. A lawyer addresses himself or herself very particularly to the interest of the client before him or her. And it’s to that person and that cause that the lawyer is particularly dedicated. Now, that doesn’t necessarily mean justice, that means giving the best possible representation to the issue that that individual presents to the courts or to the situation. Heffner: Why was it that we have assumed – and again, I don’t mean your profession – but that so many of us who, even those of us who are fairly well educated, have assumed a kind of connection between the law and justice that does not seem to exist? McKay: Oh, I hope there is a very close connection between the law and justice. The purpose of law is to do justice in the long run. But in order to do justice in the adversary system we have, with the two sides being represented, each by either lawyers, is of course the theory in which it works the notion is that out of that confrontation or conflict or presentation will come as near as may be the truth. And from the truth it is possible then for the decision maker, judge or jury, to determine how particular disputes should be decided. You say, “As the theory goes”. Do you accept that theory? Well, there…of course I accept the notion that the adversary system works and works well for us. We’ve taken it from the Anglo-American tradition, from our British forebears. It has limitations, as any theory does, because not all lawyers are equally able. Not all resources are equal. Now, we have various ways to balance that out, but obviously nothing works quite perfectly when you have to deal with human beings and the fallibilities of all of us. Heffner: Dean McKay, it’s strange. Let me ask you a question very directly. Do you feel compelled to be more of an advocate of your advocacy profession in this setting than you would perhaps in a meeting of your fellow deans, fellow lawyers? McKay: That’s a fair question. I’ve been very critical about a number of aspects of the way in which the profession is organized and about a number of aspects of legal education, out of which I come. I think we can do it a lot better. I think lawyers and the system do not give as much attention to justice, in the abstract and in the particular, as we should. But I stand four square behind what we are trying to do. And what we seek to do is to prefect the system in which we operate. It doesn’t work perfectly. It can do better. The ethical standards can be improved. All these things. Heffner: when you say, “we”, do you think – a leading, baiting question, I know – do you think that lawyers as a group, composing a profession, are by and large as concerned with these ethical concerns, these ethical principles, this end, justice, as other professionals are, by and large, about the end of their profession? Let’s go back to doctors. McKay: Let me go back to something you said in your introductory remarks. You said that lawyers are less concerned with preventative law than doctors with preventative medicine. Well, I know what you mean very well. What you’re saying is that we’re not as concerned with the ends of justice in the abstract. But in reality, lawyers are very much concerned with preventive law, because most of law is practiced in the office. It’s counseling. It’s telling clients, corporations or individuals or government, what they can do, what they cannot do, and thus to keep them out of trouble. Very little of the law practice, despite many of the television shows to the contrary, actually has to do with dispute resolution in court, dramatic criminal or civil trials. Most of the legal practice is at the advisory level, the counseling, the negotiating. And eve with cases that come to court – I’m talking about civil cases now – about nine tenths of them are settled before they go the full distance of a trial. So that lawyers are, seek to keep clients out of trouble, seek to keep them out of court, and once they’re in court, seek to make it as expeditious as possible. Heffner: Let’s continue this analogy for a moment. Let’s go back to the medical profession. There’s an epidemic, or there’s a carrier, there’s a Typhoid Mary. Do you think medical people are…you picked me up on something. You said doctors are concerned about their patients’ health; lawyers are concerned about their clients’ well-being. It has seemed to me over the years in, maybe just in this setting, in talking with doctors and with lawyers, that in the medical profession there is a larger concern for health generally – health – rather than with the well-being of an individual patient. Not that that’s not of great importance. Do you feel the same thing is true with the lawyer, as law is practiced in this country today? McKay: I think probably not as much. And that really has to do with the way the profession is organized and what it’s all about. The notion that it’s a client-centered profession, and so there is not the concern by the individual lawyer with the generalities of making the system work well, but of making sure that that client’s cause is properly presented and as adequately advanced as possible. Now, when I say lawyers are concerned about justice at large, I think that’s something they do mostly outside of their individual office practice. McKay: They do it in bar associations, in American Law Institute, in law reform activities, in continuing education and in legal education and instruction for the future, and in preparation of ethical codes and standards, and in legislative drafting, and even in lobbying activities. Heffner: Do you remember in one of your writings that you used the number “half a million” lawyers? McKay: That’s about the number there are now. Not quite that many in practice, but nearly. Heffner: What percentage would you say, would you guess, involved in the kinds of activities you just ticked off? Heffner: Small minority? Large minority? McKay: Well, we can start out this way. Out of the approximately half-million lawyers now, there are more than 250,000, more than half of that total, are members of the American Bar Association. An additional proportion would be members of some state and local bar association. I would say that a very substantial majority of all practicing lawyers are members of some organized bar which is the corporate presence for the united interests of lawyers. Now, not all of them are active. Some of them may simply receive the publications and take the benefits of the membership. But a number of them do something in that context. Heffner: I was impressed though with the categories that you ticked off for public service on the part of lawyers. And again, I wonder whether those things, let’s take simple membership in the bar association as not an indication that one is involved in these things. McKay: No, it is not. It may be that a lawyer is a member simply to get the publications and to get the professional training that is available and to be kept up to date and things of that character. That has very little to do with law reform; it has much to do with the competence of the profession in serving the individual client, and therefore the public, well. But those who are engaged in what I would loosely call pro bono activities, pro bono public activities are, I’m sure, a small proportion. You see the same faces over and over again. In New York City, you see a lot of people who do that, but still a minority. Heffner: And yet the bar association in New York City has just, I gather, rejected the notion of compulsory pro bono activities. McKay: Yes. Has said that it is an obligation for all lawyers to give, but compulsory in the sense that it would subject o discipline for those who did not. McKay: Rejected that idea. And the reason for that – I happen personally to favor the mandatory standard of pro bono service for lawyers – but there are good reasons to the contrary. Lawyers say, “Why should we be required to do what doctors are not required to do? Why should we be required to do what engineers and what teachers and what government servants are not require to do? Why are we special?” It is something that should come from the individual desire to serve. Most of us have it, so the argument runs. But we’ll do it voluntarily. We do not want to be compelled to do something against our wishes. Heffner: If I had begun this program just being very laid back and said, “Dean McKay, what’s the downside for your profession” – as I know you’ve been asked that many times – if I hadn’t begun as if I were intent upon intending to attack the profession – and I’m not, I admire it greatly. I wish I had been wise enough to have gone to law school – what would you have said in a situation in which the moderator didn’t start off by reading off the teleprompter an indictment of your profession? McKay: The downside is cost and delay. Heffner: What do you mean, “cost and delay”? McKay: It’s too costly to have legal representation, and there’s too much delay in the system. Heffner: Why, for both of those? McKay: On cost, I don’t know that lawyers are consciously overcharging. It’s expensive to do anything now. Court time is terribly expensive for lawyers, because they have to have so much backup of personnel to the system in getting ready for trial, in getting the records transcribed, and in preparing witnesses and investigation, all those things. Heffner: Excuse me. Isn’t that a strange thing to say when it has to be predicated upon the basic assumption of letting you charge for these things in the first place? Then you end up with its being very expensive. McKay: Well, what lawyers have to charge is for the high overhead of their office establishment and of the investigation they need to make in, take an antitrust case, or take a criminal case, or take a contract resolution case. All those things are now very expensive to mount. Now, some lawyers are getting very rich indeed. Some people in all professions are getting very rich indeed. Lawyers do not have the same take-home, even at the top, as the highest corporate executives. But on the average they do pretty well. But lots of lawyers are not taking home very much. The cost to the client is the thing I’m talking about, and that’s related intimately to delay, because it is now so costly to go into court, to have discovery, to have investigation, to have witnesses, to pay for the trial days necessary for the lawyer and the supporting staff, that many worthy causes that used to be tried in court now almost have to be settled out of court because the net gain is less than the cost of doing it. Now, that means that unless the issue is very large, very important, or a great deal of money is at stake, that a lot of things simply aren’t’ resolved, and their injustices are let go by. That’s too bad. Heffner: Does that happen terribly often? McKay: I fear it happens increasingly often. In a simpler day, minor disputes of contract or tort or property or what we would now call consumer complaints could be dealt with fairly simply and fairly summarily in the courts. But now it tends very often to be more expensive than the value of the matter at issue, and so unless a person feels very deeply or has a principle that must be established for other cases, they’ll say they can’t afford to do it. I talked to a lawyer who said he had a defective vacuum cleaner. Clearly defective. He had a right against the company, he was sure. But he said, “It will cost me more to get back my $150, $350” – I don’t know how much a vacuum cleaner costs – “than it would be worth to get the corrected thing. I’ll go out and buy a new one”. There’s something wrong with that system. McKay: Well, there are, in most jurisdictions, so-called small claims courts in which you can take matters of that character. Sometimes those work very well, but they have a lot of problems in addition. I think we must do more of that, and we must work to perfect them. We can do more in the way of arbitration and mediation. Simpler things that do not require as much legal personnel, for instance. We don’t need lawyers for all kinds of disputes. Where there are simple fact questions, the persons involved are perfectly adequate to put them forth before a judge or a fact-finder, he doesn’t have to be a judge, who will sift out the reposing claims and make a judgment. Usually right, sometimes wrong. But to get it settle is sometimes the more important thing. Heffner: Do these concerns appear in the criminal justice system too? McKay: The criminal justice system, in my judgment, is even more defective, more difficult to deal with. The problems there are the mass of crimes, and as you know, the rates of crime both in misdemeanors and serious crimes, the felonies, are mounting. The staff to deal with them is not mounting equally effectively. And so we have enormous delays in criminal courts, and unevenness in the way they are handled, and the problem of representation. Seventy-five to 80 percent of all criminal defendants are represented at public expense, because they tend to be, the persons charged with crime, tend to be the poor people. And as indigents they’re entitled to public representation. So that we then have built now a substantial cadre of public servants, lawyers, dealing with those problems. I think they do very well at it. But their resources are limited. The public is not very generous in defending those who are charged with crime. Heffner: So that justice is not guaranteed by the presence of an attorney? Justice. McKay: No. justice is never guaranteed in the system. We’re trying – when I say “we”, the legal profession, the public, the press and the television – are all trying to combine their forces to figure out better ways to do it. But justice has never been guaranteed, because we don’t know what justice is. Heffner: Would you take a flyer at what it is? McKay: Well, that’s been debated from Plato and Aristotle through all time. It’s to try to be fair, rational, reasonable, diligent, efficient, and to treat persons in an equal and fair way. Equality and fairness, I think, are the essentials. Heffner: You know, it’s interesting. I was thinking the other day of that wonderful expression, “With liberty and justice for all”, and added the note to myself, “Not equality, not property, but justice, along with liberty”. It seems so strange that we find it so difficult to define what has been basic to this nation. McKay: Well, it’s no different than saying we don’t know what truth is. The courtroom search, for instance, is for truth. Heffner: For truth or victory? McKay: I’m talking about the court, not the individual attorneys. McKay: and yet we have all sorts of rules, which I believe in, that obstruct the search for truth. The evidentiary rules (what can be admitted, what cannot be admitted), the privilege against self-incrimination (that certain testimony cannot be had), the prohibitions against unreasonable search and seizure. These are all limitations upon what might be found by a court that was concerned only with finding truth. But we have other values, which are equality, privacy, decency, non-governmental intrusion, protection against self-incrimination, that we believe take precedence over truth in the ultimate sense. So it’s, the search is for what I call courtroom truth. And it’s perfectly justified, but it’s not truth. Because we don’t’ know what truth is any more than we know what justice is. Heffner: How do you teach a lawyer, how do you as a teacher of law deal with this question of what the lawyer’s responsibilities are in relation to truth, in relation to justice? McKay: that’s interesting, because until fairly recent years, most law schools did not require that there be any teaching of professional responsibility or ethical standards, whatever you want to call them, morality and the law. And indeed, I too often thought, I thought too often the law schools were concerned with teaching lawyer show to play it pretty close to the edge and to, not cheat, not be unethical, but how to shad it in for the advantage of the client. And client-centered is the notion. About eight or ten years ago, the American Bar Association for the first time required of its approved law schools, the accredited law schools, that they offer professional responsibility instruction to all students in what we call the Code of Professional Responsibility. Now, that again can be taught in various ways. It can be taught as, here are the rules and here’s how close you can get to violating them without getting in trouble with the discipline committee. I like to think that most law schools now, and the better teachers in all law schools, are concerned with teaching that there is a responsibility that goes to the client and to the system. Heffner: Dean McKay, you say you like to think or would like to think that? McKay: I do believe. Yes. That’s a change in fairly recent times. It’s often said that many students go to law school with highest aspirations to serve the cause of justice. Here we come back to it. And very often it is speculated that they come out a little more cynical, a little big hardened, a little bit less concerned with the common welfare, ad more concerned with the individual welfare of the client. Heffner: I was digging here through my papers to come across an item that i put away sometime in the past (and I probably can’t find it). It was called “The Slippery Slope”. Here it is. It was an op-ed piece in The Times just after Watergate. And it was written by a former Washington correspondent of The New York Times who was then at a leading law school. And he said, “Those who place the ultimate blame for Watergate on Richard Nixon’s childhood go back too far; those who place it in the tendency of White House power to corrupt don’t go back far enough. The origins of moral relativism lie somewhere in between in a quasi-mystical demeaning, aggrandizing, relativizing, inflating, mind-sharpening, boring, stimulating, feared and corrupting experience known as law school”. He said, “It is at law school that life begins to be lived on the slippery slope”, which I think you’ve described. McKay: I resent his characterization, or his or her characterization, whoever it was. Watergate is a terrible phenomenon in American political and governmental history, and there were a number of lawyers involved. But they were not acting as lawyers. They were acting as counselors and advisors to the president in a variety of capacities. They were White House staff. They were not there really as lawyers. Even John Dean, as counsel to the president, was acting not as a lawyer primarily. Heffner: But that wasn’t his point. His point was that he felt that, given the fact that there are so many people trained in the law in our government, that t heir training had been to start the way down the slippery slope. McKay: I think that was those individuals. They were out to corrupt something larger than an individual case. And I’m not saying that law schools teach to corrupt individual cases or to corrupt lawyers. They teach to play it for the client. It is a client-centered profession. There’s no question about that. I think too much so. But that doesn’t mean it’s venal or necessarily mean. Heffner: If you say, “Too much so”, how do you diminish that “Too much”? McKay: Well, the Code of Professional Responsibility I mentioned before is now under review by the American Bar Association by a commission which is examining whether the rules should be modified in some respects. I believe – I’ve been a member of the commission – that it’s perfectly possible to preserve the adversary system (which I believe in), to preserve the client interest and client confidentiality, and yet have a concern with what you described as the doing of justice. You may not even use the word “justice” in the proposed model rules, but that’s what we’re talking about: how to perfect the system so that the interests of the client, while preeminent, are balanced against the interests of third parties, of the public as a whole. That can be done, I think. Heffner: Of course, I was reading your “The Rationing of Justice” and was fascinated by these paragraphs. “Even the great jurists were not immune”. This question just discussed. “When Learned Hand, as a young federal judge, advised Supreme Court Justice Oliver Wendell Holmes to ‘Do Justice’, Holmes answered abruptly, ‘it is not my business to do justice, and it is my business to play the game according to the rules’. Similarly it is said that when a student at the Harvard Law School asked, ‘But is that just’? The instructor responded, ‘IF you want justice, you should have gone to divinity school’”. McKay: Let me respond to that. I quoted both those things, that’s quite right. Oliver Wendell Holmes, in fact, had very high aspirations for what the courts and the system could do. And while they may have been “playing the game according to the rules”, as he put it, he was, in fact, reaching and aspiring to a higher standard of justice. And as far as the Harvard Law School, that was true some time ago. That would not be said by an instructor in a law school now. There’s a fundamental change in attitudes. Students wouldn’t accept it. Heffner: Why do you say, “Students wouldn’t accept it”? McKay: Because the students now demand a concern for the poor, for the minorities, for the consumers, for the environment, and the faculty have shifted in that direction as well. So I think there is a much better attitude, a much more balanced attitude, if I can put it that way, in the law schools today than there was in the past. Heffner: Do you think that’s simply a switch toward another concern, away from the private, well-to-do client to this minority group or that minority group, without a basic concern for justice? McKay: Well, that’s why I tried to modify my answer by saying I think there’s a better balance in the law schools now. Legal education used to be taught out of appellate cases, and it used to be taught from the perspective of the potential client who could pay, which was the corporation, which was the well-to-do person, which was the government. But it turns out that the legal problems of the poor, of the consumers, of the environmentalists, are just as interesting and just as complex. And so you can teach from that perspective just as readily as you can teach from the perspective of the corporate problems directly. All these things can be done in balance. I think you do not have to give up the one in order to pay attention to the other. Heffner: And it’s your sense that the balance is coming to be made, that we’re coming closer? McKay: It’s better, it’s better. Heffner: I think that’s probably the best place at which we could end this program, on that up note. But Dean McKay, stay. And after we say goodbye to our audience, we’ll regroup our forces and come back and continue this program for the next week.